During my visits to Bangalore, I’ve prepared healthy and filling salads for my daughter to carry to work. She doesn’t like me adding fruit to the salad. The salads have to be filling and yet not too heavy. Pasta salad is one of the salads I prepare just not for her but also for myself. Hot days usually means salads for lunch. I pack the dressing separately so that the salad stays crispy and one can choose the amount of dressing they want to add to the salad. This parsley and walnut pesto tasted so amazing. Since it was a simple salad, the star is the pesto sauce. Initially I thought that the taste of parsley would be overpowering but believe me it was not… and I had to use the curly parsley instead of the flat one. Usually pestos call for a copious amount of olive oil. I decided to reduce the amount oil and used a bit of water instead. If you add water, the pesto stays good only for a few days in the fridge. This salad is a great picnic salad too. Feel free to add whatever veggies you want. When I prepared this salad, I didn’t get any greens( would have loved to add some!). So here’s the simple and quick healthy lunch salad. Lightly roast the walnuts in a frying pan over low heat or in the oven. Let the walnuts cool down completely. Add walnuts, oil, water, garlic, salt, pepper, parsley and cheese into a food processor . Process the mixture till it becomes a coarse paste. Remove the pesto from the processor and store in a jar till required. Cut the cherry tomatoes into half or if you’re using normal tomatoes, cut them into chunks. Cut the cucumber into chunks or slices. I used English cucumber so I left the skin. Cut the olives into halves or if they are small, leave them whole. Cut the bell pepper into chunks. Add the pasta and mix everything. If you’ve prepared this salad for lunch box then put the salad in the box and pack the pesto separately. If you’re going to have this salad at home, then add the pesto and mix and serve. Add greens and other vegetables and fruits of your choice to the salad. The pesto will stay good in the fridge for 2-3 days. If you want it to last longer then add more oil and omit the water. Use whole wheat pasta if its available in your local store. I am fond of pesto as well as salads ! Combining the two would definitely be a treat . Healthy and delicious salad. LOVE that pesto dressing. Lovely salad. I do not like parsley but maybe because the 2 times I used it I used it like coriander. Will try again. Bookmarking it. Interesting ingredients for the pesto. 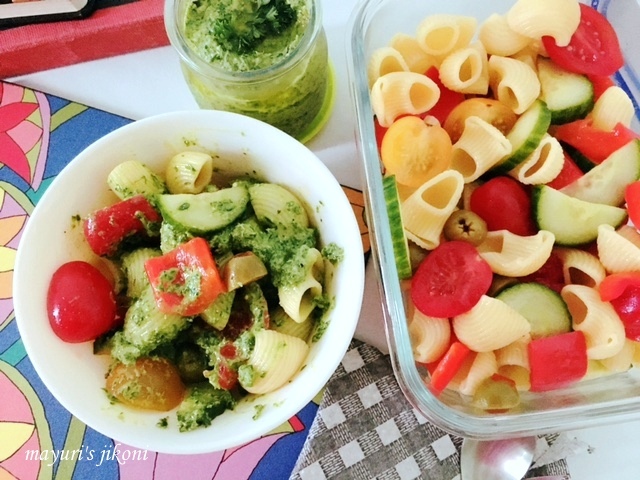 My kids will go crazy if they see this delicious pasta salad, thats a super flavourful pesto. What more is needed for an ideal lunch.. Perfect!! oh wow – what an awesome pesto! Pasta salad with pesto sounds very flavorful.